Today I had the pleasure of speaking with Todd Ellenbecker, DPT, MS, SCS, OCS, CSCS (whew!). Todd is the Vice President of Medical Services for the ATP Tour and a Director of Physiotherapy Associates Scottsdale Sports Clinic in Arizona. He was kind enough to join me to talk about injury prevention and recovery for tennis players. I received a ton of questions from all of you because injuries are a huge part of the game. We must take measures to prevent injuries, and properly recover when we have the misfortune of getting them. Otherwise, we will not be able to play the sport we love for very long. Todd’s advice goes beyond helping your tennis game, and will help you lead a much healthier, more functional life. If you don’t make time to work on your physical strength and flexibility, you’ll never reach your tennis potential. Todd, along with recent The Tennis Files Podcast guest Dr. Mark Kovacs and Paul E. Roetert, is a co-author of Complete Conditioning for Tennis. This book has been a life-changer for me and my game. I have used it to formulate my own periodized workout routine and am seeing fantastic results on and off the court because I am committed to the program. Thanks so much to Todd for coming onto The Tennis Files Podcast and providing us all with such amazing value. His expertise in the area of physiotherapy is truly second to none! [6:20] Why do tennis players get injured? [7:37] Can you get injured with good technique? [36:44] Where can our audience follow Todd online? Note: The link to Complete Conditioning for Tennis above is an affiliate link, so if you make a purchase after clicking, I make a small commission. Thanks either way! 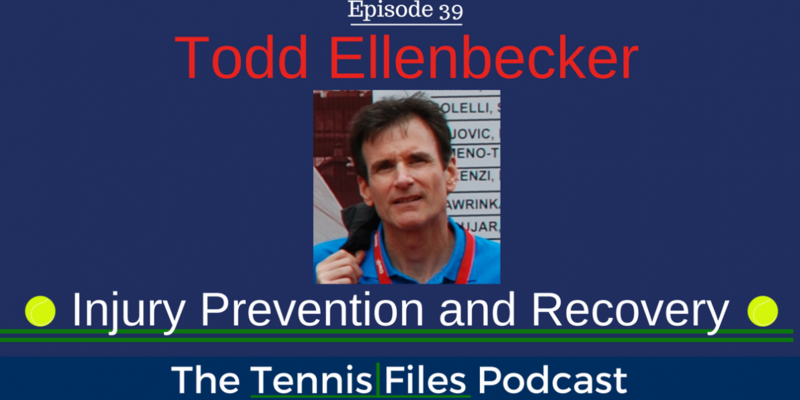 If you enjoyed my interview about injury prevention and recovery with Todd, subscribe to The Tennis Files Podcast in iTunes or your favorite podcast app! For more tips on how to improve your game, download a free copy of my eBook, The Building Blocks of Tennis Success eBook below! Thanks for listening!